We arrived at Camelback Ranch early this morning. The Dodgers have a double-header today. One at Peoria against the Seattle Mariners and one later tonight against the San Francisco Giants at Camelback Ranch. I'm assuming the game at Peoria is over. I didn't go and I don't plan on going to tonight's game. We just decided to have some fun at Camelback Ranch and watch the Dodgers go through practice drills and obtain a few autographs. It was a successful day. I'll post more on that on Monday. We'll do some sight-seeing today with the family and go to a game tomorrow. It should be fun since it's against the Chicago Cubs and those fans are everywhere. Here's a picture of my son looking around. He was very curious of the trees. 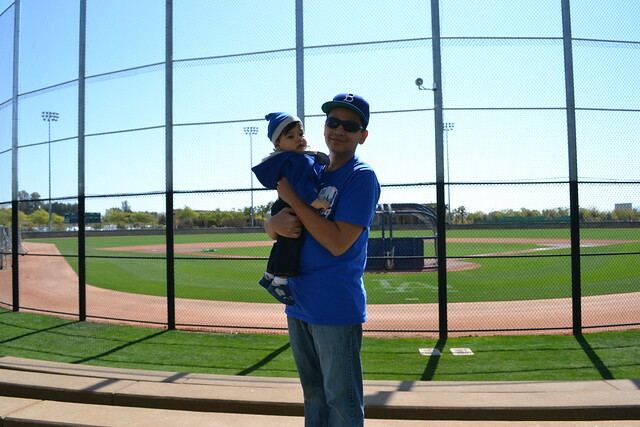 Went last year to spring training but I won't be able to go this year. Beautiful place and great atmosphere. Every Dodgers fan must make at least one trip in their lifetime to spring training. It's a special place and a special (intimate) experience you can't get at the big ballpark or at a fanfest. @ MarcoS. - I agree. A really nice place.